Good news! Based on a tip from JanneAir in this forum I disabled the Origin notifications (in the Origin app), and I have now played for several hours without a crash! This has never happened before (bf1 crashed very regularly), so the bug is probably related to sound not graphics as JanneAir said. Crash on Monte Grappa. Again. Expected it. 1min into the game after playing 2x Scar and Fao Fortress 30min each round. A thing that has been overlooked? If people get the same crashes on three EA titles, Titanfall, BF1, and now even on a game that has been running butter smooth for a few years, BF4. Doesn't anyone else think that this thing MIGHT have something to do with Origin? It's the platform that every title launches from. I don't pretend to have any idea how the the games and Origin work/function together, but the point is, that it's clearly something that is common to all the dx errors. I've said multiple times how I have managed to dodge the crashes (so far) by fiddling with Origin sound properties. That's great! Don't know if it matters, but I also went to 'VOICE' tab, seen right on the pic. There I put all the sliders down to zero, and just to be sure I chose different microphone & speaker devices for the voice chat, that I actually use in the game, as disabling the voice chat altogether - for a reason that is beyond my imagination - isn't possible. Doesn't help, after doing all this I got dxhung when loading into a map. Edit: I should also mention I changed the Origin settings then rebooted my PC and tried playing BF1 and that's when the crash happened. A very strange thing. This might change all of your beliefs till now about the Origin or Nvidia Drivers. Also I ran Call of Duty Modern Warfare 2, that crashed too. I tried the older versions of Nvidia Drivers too.. Which use to work fine. but not anymore. Nvidia or EA or a combination of them ? Apparently they both are having serious issues. Thank good for BF4 and do not dare to touch that code again EA - I want my games working when I have paid for it! I had the crash a lot in the beginning. Had. I've played tens of hours without a single crash now. How? Just play the save maps! That's it. Don't keep trying to play grappa, blitz, edge and scar. Just don't. The 5 "save" maps never ever crash for me, and the crash maps not always. I followed the usual advices from this forum; borderless, vsync off, origin overlay etc. etc. I also noticed that the most reliable driver for me is 375.63. What also helps; don't stay in a server too long. after 2 or 3 rounds exit the server, and exit bf1 and reconnect after a couple of rounds. You just won an award for the most unhelpful comment. If you think you have a solution post/link to it here instead of grand standing. Still crashing. 375.95 driver. updated BF1. gtx 770, i5-2500k, w10 pro, 16gb ddr3, dedicated ssd. I was able to play without crashes if i skipped grappa, blitz and scar. But now it crashes on other maps too. Dice/EA/Nvidia really need to get their **** together! too much "fixes" happened i guess. that is the goats revenge. there were so many weird advices around, make sure you revert all these settings and changes back to normal. wouldn't surprise me if they mess up the whole system at some point. 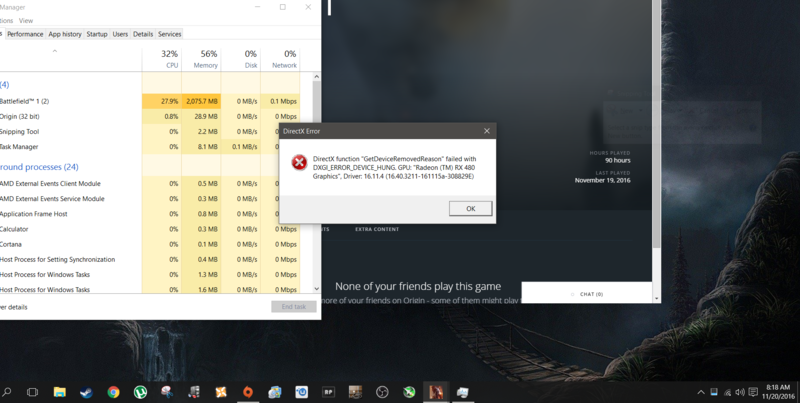 Well I thought I had it fixed, I re-installed the game, re-installed the Microsoft Visual C++ 2012 redist's in the BF1 game folder, ran Origin and BF1 and BF1Trial as admin and UNCHECKED the high DPI setting in properties of BF1. Once I did all this I went a whole day, 4-5 hours, without any crashes. But this morning I crashed in my second match of Conquest on Ballroom Blitz. So I seriously doubt doing all that did anything at all, I just got lucky for that 4-5 hour period and this morning when I was able to play one match of Conquest. Also it crashed as soon as I was about to spawn in at the very beginning of the match, this is 80-90% of my crashes, always crashes when I'm about to spawn. i know some of u are trying to help but stop posting these "psuedo fixes" they DON'T work! I can play this game for 5h and crash or i can play for 5 min and crash. Your lil fixes of "disable this, do that" DON'T work!! Stop it. ALL my other games work fine, you might have messed up something with drivers, BIOs, or windows while trying to fix BF1, don't forget to revert any "fixes" that you make. This is a BF1 issue 100%, although you could coincidentally just have another issue with your PC on top of the BF1 problem.